Salicylic acid is an ingredient used in chemical peels. These treatments, which are safest and most effective when done by a dermatologist, may be just what you need to give your face a polished appearance. But salicylic peels are very mild and won't give your complexion a complete makeover, especially if deeper wrinkles, extensive sun damage and acne scarring are concerns. A derivative of aspirin, salicylic acid falls in the category of beta hydroxy acids, or BHAs. Salicylic acid is an exfoliant and has anti-irritant/anti-inflammatory properties, according to Paula's Choice -- the "Cosmetics Cop" website. Salicylic acid can penetrate the pores of the skin, which is why it's often used in products that treat acne lesions, including whiteheads and blackheads. Salicylic acid peels are an emerging therapy to treat skin still affected by acne. Salicylic acid is used in a cosmetic treatment known as the "lunchtime peel," so named because it's designed for women on the go. Also known as a superficial or light peel, this treatment is relatively painless and has a rapid healing time and fewer pronounced side effects than deeper peels. Salicylic peels penetrate only the top layer of your skin, giving it a polished, healthy appearance. The American Academy of Dermatology says that several of these peels are necessary for optimal results. Salicylic peels, being the lightest type of facial peel, have subtle results. They can address mild discoloration, smooth out rough patches and renew the appearance of your skin. The American Osteopathic College of Dermatology says that a light peel may cause your skin to have a "red glow" that resolves within a couple of days. You can usually put your makeup back on right after the treatment, although the AAD says that in some cases, you may need to wait a couple of days. Treatments are typically delivered in a series of six to eight peels spaced two to three weeks apart. A study on salicylic acid peels by Paskistani dermatologists Bari Arfan Ul, Iqbal Zafar and Rahman Simeen Ber was published in the "Indian Journal of Dermatology, Venereology and Leprology." The study looked at 268 participants ages 10 to 60 who received salicylic peels for various facial conditions such as melasma, acne, post-inflammatory scarring and warts. Treatments were delivered once weekly for eight weeks. Common side effects included minor discomfort, burning, irritation and swelling, but these were described as "easily manageable," and almost all participants tolerated the treatments. Researchers concluded that salicylic peels are a "well-tolerated and safe treatment modality in many superficial facial dermatoses." 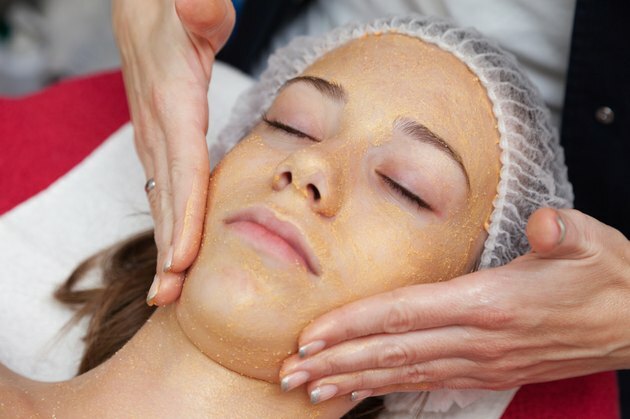 Salicylic peels may reduce subtle signs of aging and acne. But they won't give you the dramatic results offered by peels that use stronger chemicals, such as trichloroacetic acid, commonly known as TCA, or phenol. The American Society of Plastic Surgeons says that peels using TCA and phenol reach deeper into the skin and can reduce the appearance of wrinkles, photoaging, acne scarring and even pre-cancerous lesions. Chemical peels of all kinds are considered cosmetic and probably won't be covered by your insurance plan. If you're not sure a salicylic peel is the right treatment for you, talk to your dermatologist.